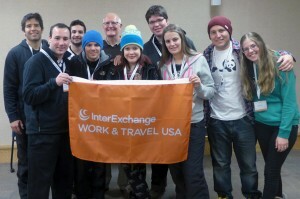 InterExchange, in coordination with the Town of Vail Public Library, organized a unique cultural experience for international students spending the winter in Vail through the InterExchange Work & Travel USA program. InterExchange staff joined our participants from Paraguay and Argentina, along with host employer Greg Croff of The Ritz-Carlton Residences, to volunteer at the Town of Vail Public Library on Wednesday, January 29th. The evening began with a short presentation from Librarian Liz Willhoff, highlighting the variety of resources the library offers the local community. The library has a limited full-time staff, relying on volunteers as a valued asset in the upkeep of their collection. By straightening bookshelves, pulling books out of circulation and cleaning and storing tables, the group was able to provide greatly appreciated help to the local host community while learning about the importance of volunteering and the value of local libraries in American culture. Library Director Lori Ann Barnes issued library cards to participants, allowing them to borrow books, movies and music and to use the library facilities, including free Wifi. She also highlighted how the library is a great resource for reading more about American culture as well as getting a more detailed history about the local Vail area. After having the opportunity to browse the library's collection, participants enjoyed a pizza dinner at Blue Moose Pizza in nearby Vail Village. Participants discussed their experience, chatted about other U.S. cities they want to visit and learned how to eat pizza like an American, folded and eaten with their hands!